REACh stands for Reorder – Extend – Advance – the Church. A presentation document can be found here. 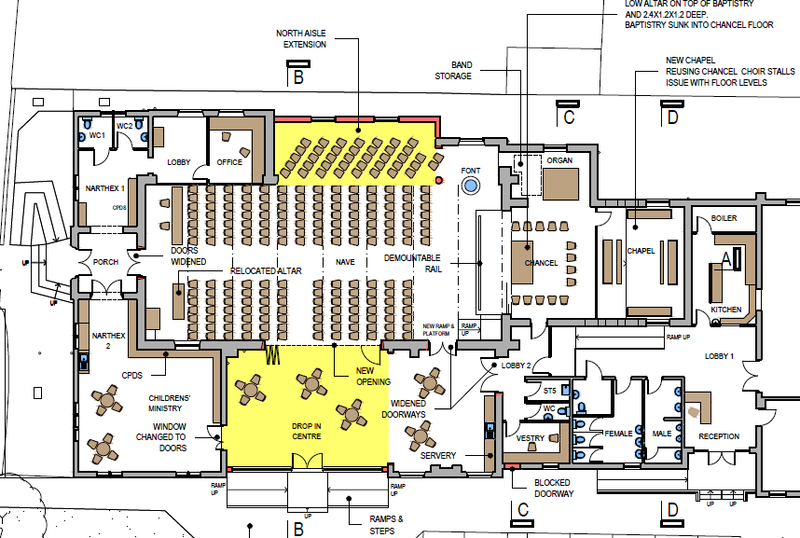 At a vision day in February 2016, those present unanimously voted to commission an architect to draw up plans to reorder and extend the church, specifically to rework the chancel area, narthex area and build a new drop-in cafe to the south. The PCC set up a Steering Group to liaise with an architect to develop the ideas. In March 2017 an Extraordinary General Meeting formally approved plans to go ahead and seek planning permission etc, including for a north extension. The plan below gives a general idea of the work envisaged. A written report from the Extraordinary General Meeting is reproduced here. Following this meeting, the Reordering Steering Group are getting on with delivering the project. In May 2017 the architect’s initial feasibility report arrived. The report can be accessed by clicking on this link.